U of I team designs "bark park"
Along with their human best friends and people who just adore wet noses and wagging tails, dogs in Jacksonville, Illinois, will soon have a place for off-leash romping and socializing. A seven-acre parcel of city land on Jacksonville’s southeast side is being transformed into a dog park, designed by U. of I. students in the landscape architecture and the recreation, sport and tourism programs. Construction is expected to begin this fall on the park, tentatively called the Jacksonville PetSafe Dog Park. Browning is a lecturer in recreation, sport and tourism and a landscape architecture specialist with the department’s service unit, the Office of Recreation and Park Resources. ORPR’s director, Robin Hall, and its community services and education coordinator, Jarrod Scheunemann, also worked on the project. ORPR Team Members, from left: Lara Browning, Jarrod Scheunemann, Kerri Schiller, Robin Hall, Yexuan Gu, Zelda, Jing Wang, and Farzan Rostam-Abadi. Rostam-Abadi and Kerri Schiller, a graduate student in the same department, conducted the background research and budgeting. Alumni Yexwan Gu and Jing Wang, then graduate students in landscape architecture, created two design concepts – a contemporary design that included amenities such as a sponsorship seating area and high-end agility equipment, and a natural design with rustic hiking trails and native prairie grasses. Jacksonville officials and members of the Bark Park Initiative, the group organizing the fundraising and outreach efforts, decided to combine elements of both concepts – such as the prairie grasses and the sponsorship seating – into the final master plan. The first phase of construction is funded with a $100,000 grant that Jacksonville residents won in the PetSafe Bark for Your Park online contest last year. While the cost of fencing is expected to consume most of those funds, the Illinois team’s concept drawings will help with fundraising, and they suggested other grants that organizers can pursue, Browning said. 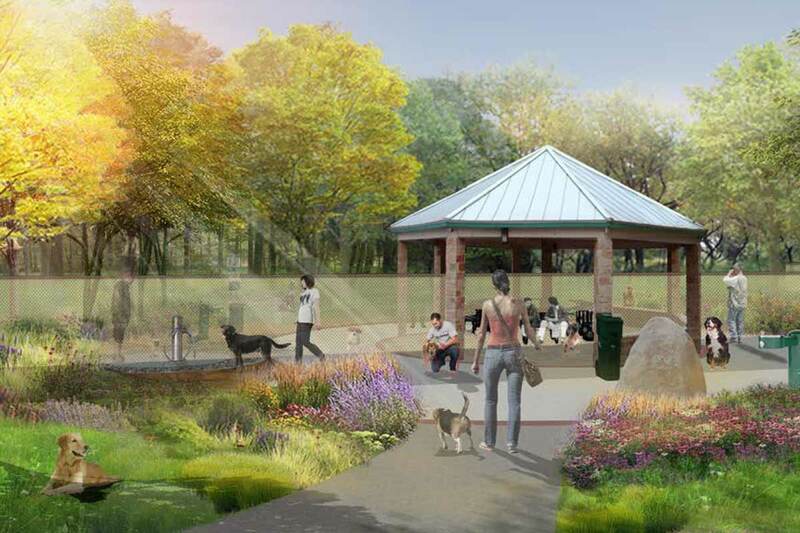 As funds become available, organizers plan to add a boardwalk, pavilions, a splash pad and a path connecting the dog park with neighboring Nichols Park.